Good morning! I finished these projects just in the nick of time yesterday. They are my final 2 projects for the Verve release week challenges. My card is for VSJan10E, Tosh's (Get in Shape challenge to make any size card except the standard A2). Mine is a 5" square card and I used CPS sketch #149. I kept my card clean and simple to show off the beautiful texture of my white card base. It's called Ruche, and it is described as a mulberry and cardstock hybrid... I love it! I wasn't exactly sure how well it would take ink, but I was pleasantly surprised that I could stamp my sentiment onto it without any problems. See below for a closer look (you can also click on the photo to enlarge). 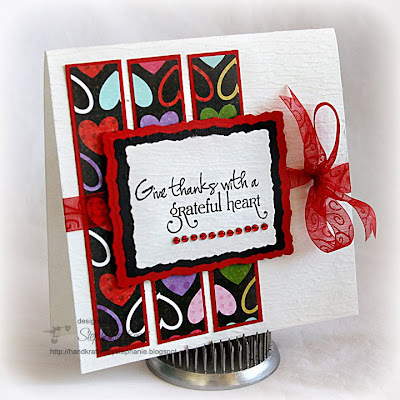 The sentiment is Verve's Grateful Heart plain jane (single stamp). 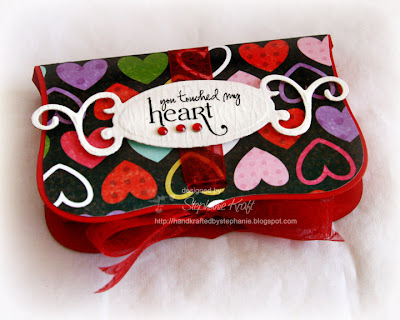 My second project is for Sankari's challenge, VSJan10B, which is a 3D challenge to make a Valentine's treat box. I made a Labels 8 box using the above mentioned Tosh's fabulous tutorial here. 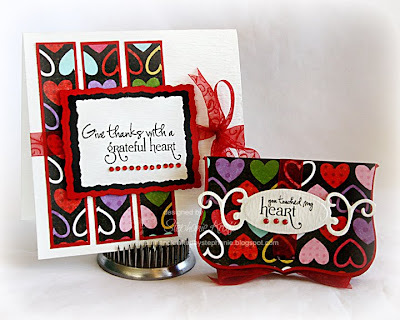 I finished my box off very simply with a sentiment from Verve's Thankful Hearts. Accessories: Deckled Rectangle Nestabilities (Spellbinders), Rhinestones (A Muse), Ribbon, Foam tape. Accessories: Labels 8 Nestabilities, Fancy Tags (Spellbinders), Slot punch (SU! ), Rhinestones (Kaisercraft), Ribbon, Red line tape, Foam tape. Such a cute gift set! I love your box. Oh wow Stephanie - I love the way you've put that paper against the white - stunning! I just LOVE these Stephanie! The colors and paper are awesome and I LOVE the clean layout and bling!! These are awesome -great mix of color and design! These are fabulous! The font on those sentiment stamps rock!! Thanks for joining us at CPS this week! wow!! what a gorgeous set!! Awesome! Love your Labels 8 box!